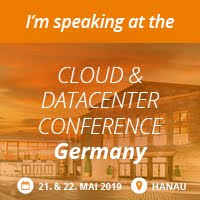 Last year I had the opportunity to head over to Munich and present at the awesome Cloud and Datacenter (CDC) conference organised by my good friend and well-known MVP Carsten Rachfal and I'm delighted to confirm I've been invited back again this year to present at CDC 2018. I really enjoyed my time presenting over in Munich last year and the conference was packed with some of the best cloud and datacenter-focused speakers from around the world (the plentiful food and quality local beer helped too!). The attendees also came well prepared with some excellent interaction and questions across all of the sessions that I watched or was involved in. This years event is being held in Congress Park Hanau (just east of Frankfurt) and with nearly thirty speakers already confirmed, it has the makings to be an even better conference than last years one - which will be hard to top! Held over two days (15th & 16th May) and across six different tracks, there will be a mixture of sessions to choose from - some in English, some in German. You can register to attend CDC Germany 2018 here and I'll post back with an update closer to the event. SCOM 1801 Has Just Been Released!